I have quickly and expertly handled hundreds of DUI cases in the courts of Clark County, Nevada. You will personally meet with a Nevada licensed attorney and your case will be handled by me. I will sit down with you in a free consultation and fully advise you of all your rights, the criminal and civil penalties that you’re facing, and the likely outcomes. I understand your situation, I believe that good people make mistakes, and I’m here to make sure that you get the best representation. Attorney Ryan Alexander will defend your constitutional rights. Call (702) 868-3311 for more information and take care of your DUI today. What are the main issues in a typical DUI case? 1. Did the officer have a legal reason to stop your vehicle? Referred to as “probable cause,” there has to be a legitimate reason to pull you over. Usually this is for a minor traffic infraction like changing lanes without signaling,not having your headlights on after dusk, having a burnt out tail light, going at least a mile an hour over the speed limit, making a U-turn in a “no u-turn” zone, etc. However, driving slowly, movement within your lane, sleeping in your vehicle and other behaviors may not be sufficient probable cause, and those will become parts of your defense. 2. Did the officer have a reason to have you exit the vehicle, and to perform Field Sobriety Tests? Once you are stopped, there has to be a reason that the officer suspects you are under the influence of alcohol to have you perform Field Sobriety Tests. These are the tests where he moves a finger in front of your face, you walk heel-to-toe, or stand on one leg. Usually, these tests are given because the driver admits to drinking. And pretty much everyone stopped says, “two beers,” or, “a couple of beers.” (Never say that you have been drinking, because it gives the police the reason to test and arrest you – you will not get lenience for honesty at this point of a traffic stop!). The officer will indicate on his report that you had red cheeks, glassy or red eyes, slurred speech, clumsy movement, etc. and you may have medical conditions, contact lenses or other issues that cause such appearance or behavior. 3. Were the Field Sobriety Tests performed properly? 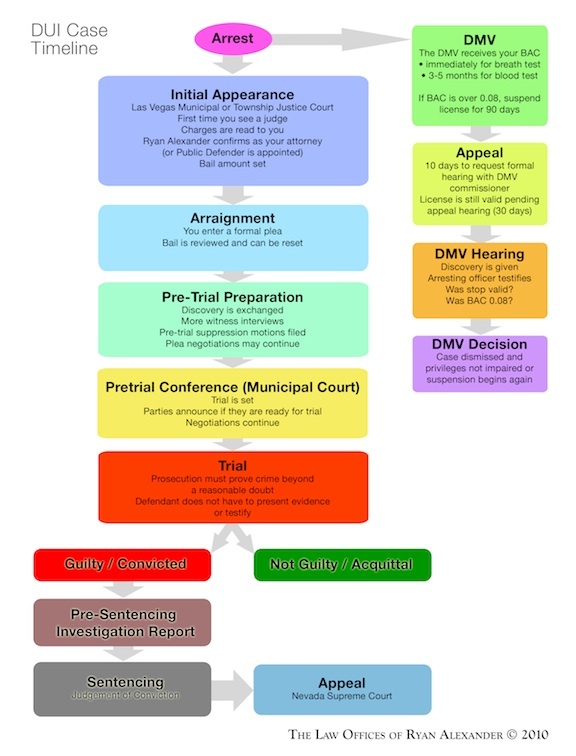 The physical tests that lead to the decision to arrest for DUI are varied, but must be administered according to specific guidelines from traffic police manuals. Where they are performed – lighting, surface conditions and angles, weather – and how they are administered needs to be reviewed. Further, whether they used a portable breathalyzer and its reading will be examined, even though the results of the hand-held breathalyzer cannot be admitted in court as they are not accurate enough. 4. Were the breath or blood tests taken at the police station or jail performed properly? After a person is arrested for a DUI, they are taken to a police station or jail for ‘booking’ and to have further testing of their blood alcohol level (“BAC”). Operating a vehicle on a public accessible road with a BAC of 0.08 or more is illegal, although charges can arise with lower BAC if you are still considered “impaired.” The two tests are either breath tested on a larger breathalyzer machine, or blood drawn by a nurse who sends it to a lab for testing. We review the evidence provided to see if the proper procedure is followed, the machines used were calibrated, the tester was qualified, and that the person performing the tests is to be a witness. Again, medical conditions, dentures, certain medications and other situations can distort your results and needs to be brought up in your defense. What happens with the DMV when I’m charged with a DUI? Will I lose my license? My job as your attorney is to help you keep your license if it is possible. The DMV proceeding is not a criminal procedure and their standards are much broader (making it more likely that your license will be suspended). I will tell you based on your facts the likelihood of victory and advise you accordingly. I do not charge you for DMV defense proceedings unless it is needed. How the process works is different depending on which test you take at the police station: breath or blood. Breathalyzer – if the breathalyzer returns a reading of 0.08 or higher, the Nevada DMV will automatically suspend your license for 90 days, and your license will be considered suspended immediately. The police will give you a sheet of paper advising you of this with instructions (it’s usually pink in color). From this date, you have 10 days to request a hearing at the DMV, which I will handle if you meet with me early enough. The DMV will set the hearing one month after they get a request. During that time you are waiting for the hearing, your license will be valid. You can get a restricted license to travel to work, shopping and church after 45 days of suspension. Blood test – blood test results will take several months to be returned to the police and sent to the DMV. You should check in with the DMV occasionally to make sure that they have not sent a notice already, and you need to be absolutely certain that they have your current address on file, or you may not get the notice at all. If the blood lab returns a reading of 0.08 or higher, the Nevada DMV will suspend your license for 90 days, and your license will be considered suspended from the date that they send you a notice. From the date that you receive the notice by mail, you have 10 days to request a hearing at the DMV, which I will handle if you meet with me early enough. The DMV will set the hearing one month after they get a request. During that time you are waiting for the hearing, your license will be valid. You can get a restricted license to travel to work, shopping and church after 45 days of suspension. Revocation of your driver’s license for at least 90 days. $60 fee for chemical analysis if you have had a breath or blood test and are convicted/plead guilty to DUI. If you are under 21, or have blood alcohol of 0.18% (more than double the limit), or are being charged with a second offense, you owe another $100 and have to undergo an Alcohol Addiction Evaluation AND you have to attend a substance abuse treatment program. The danger of an Evaluation is that it places on your record evidence of an alcohol problem, something that will haunt you if you are ever charged for similar crimes. If you are found guilty, the court can choose to make you install a “breath interlock device” on your car which makes your car inoperable if you have alcohol on your breath, all at your expense. It will stay on your car for up to three years. On top of all of the criminal penalties, if found guilty you owe a $35 civil penalty to the DMV. You will be required to buy an SR-22 Proof of Financial Responsibility from your insurance company. Click for details. How can Attorney Ryan Alexander help you avoid all of these punishments? For starters, I may find facts or notice missing evidence that allows the charges to be dismissed or a trial to lead to a not guilty verdict. Or, with a strong defense the prosecutor might be inclined to offer a lesser charge, such as a First Offense when you’re in on a Second DUI charge, or a Reckless Driving in the place of a First. Since you may notice the punishments increase dramatically with each subsequent arrest, it is in your interest to get a plea or offer for a lower level of DUI or non-DUI traffic charge. Lastly, I am here to make sure you understand your rights, the facts in evidence, and the punishment you face before you make any final decisions. Since the penalties are high and can seriously impact your every day life (such as losing your license for three months, a year, or even three years), this is an important time to have the experienced guidance of an attorney.